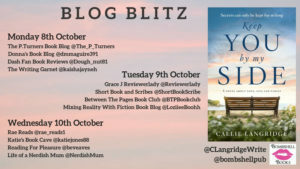 I’m so pleased to be reviewing Keep You By My Side by Callie Langridge today. My thanks to Bombshell for the place on the tour and the review copy of the book. Are family secrets the ties that bind or the lies that divide? The secrets of one family live in the walls of a cottage perched high on a Dorset cliff. But secrets can only be kept for so long. Follow three generations of a family from war-torn London, to the permissive 60s and liberated 80s. Gertie, Rose and Abi live through joy, tragedy and heartache as they navigate complicated mother-daughter relationships and learn the importance of friends and finding love. When circumstances force them under the same roof, secrets begin to unravel and promises made in love threaten to tear them apart. I was a huge fan of Callie Langridge’s first book, A Time to Change. If you love time travel/time slip books then I’d highly recommend it. As you can imagine, I was keen to read her second book to see if I loved it just as much. 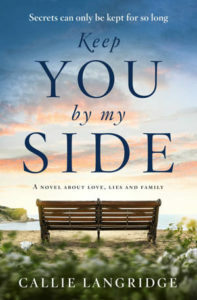 Well, the answer is I didn’t love it quite as much (it had a lot to live up to) but I did still really enjoy Keep You By My Side as it has so many of the elements that I love and I think that it will appeal to a lot of readers. This is a story of three women: Gertrude in the 1940s, Rose in the 1960s and Abi in the 1980s. They’re three generations of the same family and each of them has their own issues to deal with. Gertie is living through the war years and is desperate for a child but none seems to be forthcoming. Rose is clever and hopes to be a doctor but unexpected events change her life forever. And when Abi and her family move into Cliff Cottage in Dorset, which is her nan’s house, she has to deal with the upheaval that brings and secrets from her mother’s past that come to light. There is a lot of warmth in this story. I particularly loved Gertie and thought she was a lovely, tolerant character. Rose and Abi were great too, but I didn’t find them quite as endearing as Gertie. I really liked how each chapter was told from the point of view of one of the women and so we jumped around the decades as the story unfolded. Not everyone’s cup of tea but I really enjoy that in a novel. This is a story which looks very much at the effect of secrets and lies through the generations and begs the question, is it better to hide those things that could cause distress or should you always be honest no matter the consequences? I’m not sure of the answer myself and certainly being truthful wouldn’t have helped the characters in this book very much at times. I really liked how all three stories converged, particularly at the end. It’s a moving look at the relationship between mothers and daughters, and how sometimes doing what you believe is the right thing can have an unexpected effect further down the line. Keep You By My Side is a beautifully written, emotional and sometimes heartbreaking story. Callie Langridge has written a moving study of family life. Having left school at 16, she studied drama before embarking on a career in marketing. This saw her work in music marketing in the heady days of Britpop in the nineties. She unleashed her creativity in the design of window displays and marketing campaigns for the leading music retailer. 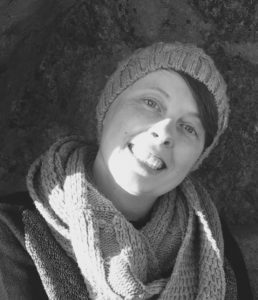 More recently she has followed her passion for history, working in marketing and communications for historical and cultural organisations. On hitting her thirtieth birthday, she decided finally to pick up her pen and take the first of many creative writing courses. A few years later and she has had a number of short stories published and plays performed at theatres and venues across London. Her first novel A Time to Change was published in September 2017. Her second novel Keep You By My Side will be published in October 2018. Callie lives in London with her long-term partner, an ever-growing collection of antique curiosities, and more books than any person really needs.